PURPOSE: The purpose of this research is to evaluate the relationship between of optic atrophy 1 (OPA1) polymorphism and normal tension glaucoma (NTG) by surveying patients from central Taiwan. This study finding could help us to understand the impact of OPA1 polymorphism on glaucoma. METHODS: We try to identify the effect of OPA1 polymorphism by comparing the clinical presentation in three catalogs of gene polymorphism in patients with NTG. Our research team includes patients with NTG from central Taiwan and assesses the OPA1 intervening sequence 8 (IVS8) + 4 C->T and IVS8 + 32 T->C polymorphism. We divide these patients into three OPA1 IVS8 + 4 subgroups, CC, CT, TT, and three IVS8 + 32 subgroups, TT, TC, CC. By collecting their ocular clinical data, systemic background, and other possible factors related to the presentation of glaucoma, we can compare these characters of each polymorphism subgroup. RESULTS: We find that all patients do not have OPA1 IVS8 + 4 C->T polymorphism while some of them do have IVS8 + 32 T->C polymorphism. 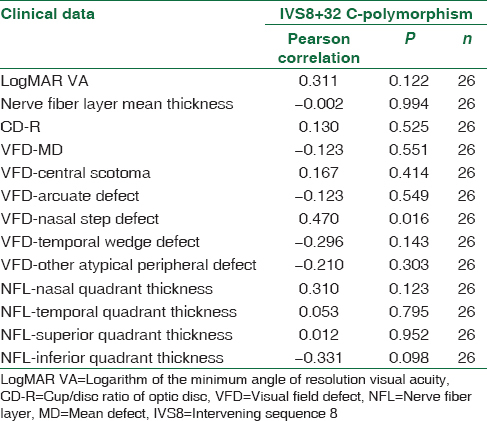 NTG with OPA1 IVS8 + 32 T->C polymorphism inclines to have more nasal-step type visual field defect (P = 0.016) and inferior nerve fiber layer thickness loss (P = 0.098) in comparison to NTG with IVS8 + 32 wild type. CONCLUSIONS: The OPA1 IVS8 + 32 T->C polymorphism partake to the phenotype and prognosis of NTG in central Taiwan. Even though our findings are far from clear enough to serve as guides for the differentiation of NTG etiologies, they still give us a glimpse of the impact of OPA1 in chronic optic neuropathy. Normal tension glaucoma (NTG) is a subgroup of open-angle glaucoma which showed progressive optic nerve fiber loss even with normal intraocular pressure (IOP). This accounts for at least 30% of patients with glaucomatous visual field changes,, A Japanese study even shows that 92% of patients with primary open-angle glaucoma have normal IOP. While the prevalence of open-angle glaucoma in Taiwan is about 2.68/1000 people, NTG could be a popular disease in Taiwan. Even though, its open-angle ocular structure, NTG shows some special features which could be distinguished from typical primary open-angle glaucoma, such as older onset age, more focal notching, more paracentral scotoma, and more disc hemorrhage. Furthermore, NTG shares some clinical features with progressive optic neuropathy and is thought as a special form of optic neuropathy. Gene optic atrophy 1 (OPA1) is coding for a mitochondrial fusion protein and is related with hereditary optic neuropathy. Its polymorphism is thought to be related with NTG, but not with high tension glaucoma in recent studies.,,, In this study, we analyze the OPA1 intervening sequence 8 (IVS8) + 4 C->T, IVS8 + 32 T->C polymorphism in our patients with NTG in Taiwan. We try to find out the difference between OPA-1 wild-type and polymorphism glaucoma group by inspecting the structure and functional changes. This study is adherent to the tenets of the Declaration of Helsinki and is approved by the Institutional Review Board of the Changhua Christian Hospital. All subjects have written informed consent to participate. To focus on patients with typical NTG, we establish an inclusion criterion for this study as follows: open-angle structure, typical glaucomatous optic disc changes (enlarged optic disc cupping and glaucomatous neuroretinal rim loss), significant retinal nerve fiber layer (NFL) thickness loss, significant visual field defect (VFD), and normal IOP (10–21 mmHg). Twenty-six eyes from 13 patients with NTG with criteria above were collected. Age of the patients was from 34 to 60 years old with the mean age of 44.62. The male ratio of included patients is 69%. Their ophthalmic clinical data which includes IOP (initial pressure and pressure under medication control), central corneal thickness, Logarithm of the minimum angle of resolution (LogMAR) visual acuity, refraction profile, pattern and degree of visual field loss, retinal NFL thickness, and cup/disc ratio from each patient were reviewed. The background data which include smoking, alcohol, diurnal, and nocturnal blood pressure, body height, body weight, and body mass index from each patient were also gathered. Blood of patients was collected from the antecubital vein and stored in K2-EDTA tube (BD, America). Then, the tube was centrifugation of 2500 rpm for 10 min to isolate the buffy coat. Genomic DNA extraction of buffy coat was performed by using Gentra PureGene DNA isolation kit (Qiagen, Hilden, Germany). PCR for amplifying the DNA fragment in the IVS8 of OPA1 gene was conducted in a final volume of 20 uL, which contained 20 ng template DNA, dNTP Mixture (2.5 mM each), ×10 PCR Buffer (contains 15 mM MgCl2), 5U of TaKaRa Ex TaqTM Taq polymerase (Takara Bio Inc, Otsu, Japan) and 5 pmol of primers (forward primer: 5'-TCTGAAGTTCTTGATGTTCTCTCTG-3'; reverse primer: 5'-ACTGGATCCACTGTTTATAGCCT-3'). Amplification was carried out in a condition with an initial denaturation at 95°C for 5 min, followed by 40 cycles of denaturation at 95°C for 15 s, annealing at 60°C for 30 s, extension at 72°C for 30 s and a final extension at 72°C for 5 min. To identify IVS8 of OPA1 polymorphism IVS8 + 4 C->T or IVS8 + 32 T->C. 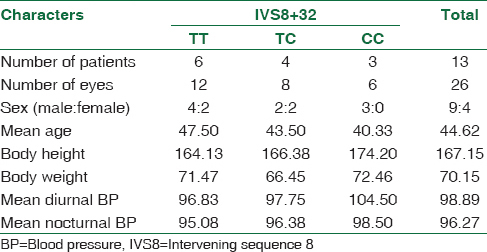 These include IVS8 + 4 CC (wildtype), CT, TT subgroups, and IVS8 + 32 TT (wildtype), TC, CC subgroups. PCR products were purified with Plus PCR Clean-Up Kit (GMbiolab Co, Ltd., Taiwan) to remove unincorporated deoxynucleotide triphosphates and primers. After purification of PCR products, the PCR products were sequenced by capillary electrophoresis on an Applied Biosystems 3130 Genetic Analyzer (Applied Biosystems). We compare the ophthalmic clinical data in each subgroup to identify the difference between each subgroup by using Pearson's correlation test and try to clarify the impact of IVS8 + 4 C->T or IVS8 + 32 T->C on the NTG pattern and severity. Two-tailed P < 0.05 is considered to be statistically significant in this study. We also analyze background data and ophthalmic clinical data of included patients by using Pearson's correlation test to see if there is any relationship between their background condition and clinical glaucomatous features. First, we check that if any included patients had OPA1 IVS8 + 4 C->T polymorphism. The results from all patients are negative; it indicates that all subjects are wildtype IVS8 + 4 CC [Figure 1]. 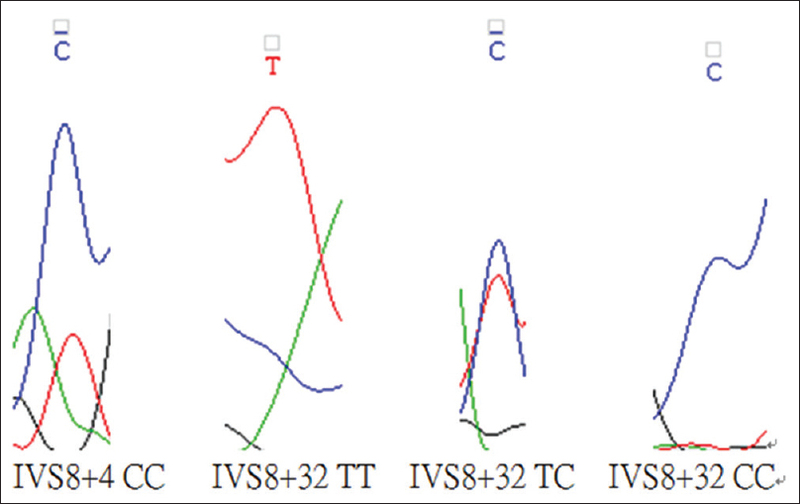 Second, we check the OPA1 IVS8 + 32 polymorphism and detect all three subtypes, OPA1 IVS8 + 32 TT, TC, and CC [Figure 1]. We had 6 subjects are wild-type (TT), four subjects are TC type and three subjects are CC type [Table 1]. We also perform Chi-square goodness of fit test to determine if the population is significantly different from the exceptions of Hardy–Weinberg equilibrium. It shows that χ2 = 3.201 and the P = 0.202 with 2 degrees of freedom. As a result, the observational data support the hypothesis that the population is at Hardy–Weinberg equilibrium for the IVS8 + 32 polymorphism. With three OPA1 IVS8 + 32 subgroups listing above, we compared their ophthalmic clinical data in each subgroup to address the impact of OPA1 IVS8 + 32 T->C polymorphism on clinical presentation [Table 2]. We assign OPA1 IVS8 + 32 C-polymorphism as a new parameter for Pearson correlation analysis, which is 0 for TT group, 1 for TC group and 2 for CC group. The result shows that OPA1 IVS8 + 32 C-polymorphism does not significantly alter the LogMAR visual acuity, average retinal NFL thickness, cup/disc ratio, and the mean defect of visual field exam. Furthermore, we categorize the pattern of VFD into several genres, including central scotoma, arcuate defect, nasal step defect, temporal wedge defect, and other atypical peripheral field defect. We find that the result of OPA1 IVS8 + 32 C-polymorphism is significantly related to nasal-steps type VFD based on Pearson's correlation test (P = 0.016) [Table 2]. On the other hand, we analyze the pattern of retinal NFL thickness loss by comparing the average thickness in four major quadrants with OPA1 IVS8 + 32 C-polymorphism, which includes superior, inferior, temporal, and nasal quadrant. We find that OPA1 IVS8 + 32 C-polymorphism is correlated with the loss of inferior retinal NFL thickness loss relatively, even though this result is not statistically significant (P = 0.098). 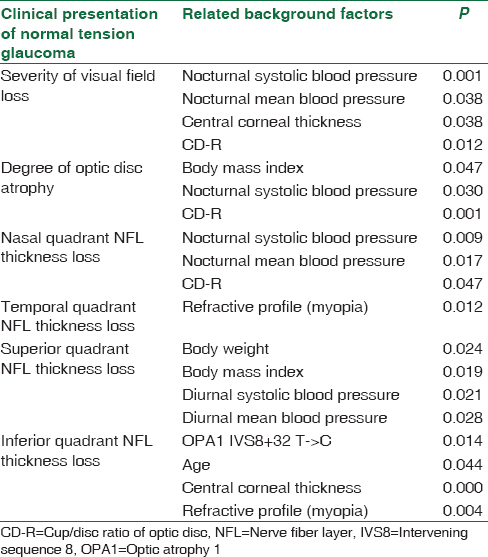 If we compare the quadrant retinal NFL loss in a relative ratio form (specified quadrant retinal NFL average thickness/total retinal NFL average thickness), we could find that IVS8 + 32 C-polymorphism is significantly related with relative inferior quadrant NFL loss (P = 0.014) [Table 3]. Finally, we compare the background data of all the patients to see if there is any other significant risk factor to be correlated with NTG. We summarize these results in [Table 4]. We detect some interesting findings as below. (1) The severity of visual field loss (the mean defect of visual field) is significantly related with nocturnal systolic blood pressure, nocturnal mean blood pressure, central corneal thickness, and cup/disc ratio of the optic disc. (2) The degree of optic disc atrophy (average NFL thickness loss) is significantly related to body mass index, nocturnal systolic blood pressure, and cup/disc ratio of the optic disc. (3) Nasal quadrant NFL thickness loss is significantly related to nocturnal systolic blood pressure, nocturnal mean blood pressure, and cup/disc ratio of the optic disc. (4) Temporal quadrant NFL thickness loss is significantly related with the refractive profile. (5) Superior quadrant NFL thickness loss is significantly related with body weight, body mass index, diurnal systolic blood pressure, and diurnal mean blood pressure. (6) Inferior quadrant NFL thickness loss is significantly related with OPA1 IVS8 + 32 T->C polymorphism, age, central corneal thickness, and refractive profile. Some factors are recently thought to be related to NTG, which including the reduced ocular blood flow, reduced ocular perfusion pressure or circadian fluctuation, inadequate regulation  and vasospasms or vasoconstriction effect, nocturnal hypotension, low intracranial pressure, and even sleep apnea. However, these findings could not explain all cases with NTG universally. In this study, we also find that some blood pressure relative factors are associated with the clinical presentation of our NTG patients. Patients with lower nocturnal systolic blood pressure and nocturnal mean blood pressure tended to show more severe visual field lost and more severe retinal NFL thinning to some degree. Moreover, it is interesting that this nocturnal blood hypotension seems relatively affect the loss of nasal quadrant retinal NFL than all other 3 quadrant. We also find that the thickness of temporal and inferior quadrant retinal NFL in our NTG patients is related with their refractive profile. This might be due to the altered optic disc structure in high myopic patients. Some findings in recent studies support that glaucomatous or ischemic eye disorders could also be related to reactive oxidative stress and mitochondrial dysfunction. They reveal that OPA1 polymorphism IVS8 + 32 t-->c or IVS8 + 4 c-->t could be related to NTG or low tension glaucoma,,,, and could also be related to the diagnosed age of open-angle glaucoma. In those studies focused on the effect of increased IOP in glaucoma model, the expression of OPA1 gene was downregulated with increased mitochondrial fission, increased release of OPA1 protein and cytochrome c from mitochondria into cytoplasm., These facts further strengthen that there might be some relationship between the OPA1 gene and the etiology of glaucoma. Different ethnic groups may have genetic heterogeneity and have different genetic pathogenesis of NTG. For example, OPA1 polymorphism IVS8 + 32 t-->c is reported to be significantly related with NTG in Caucasians in the United Kingdom  and Japanese, but not significantly in Korean  and African–Caribbean from West Indies. It is a pity that we cannot find any other research which focuses on the relationship between OPA1 polymorphism and NTG in Taiwan. These data might also be important that the etiology of NTG could be different due to the racial difference. In the present study, we prove that OPA1 IVS8 + 32 T->C polymorphism could also be found in Taiwan NTG patients. We also find that those patients with or without the OPA1 IVS8 + 32 T->C polymorphism showed different clinical characters. NTG patients with OPA1 IVS8 + 32 T->C polymorphism tend to have more nasal step VFD than wildtype, and they also have a relatively thinner thickness of the retinal NFL in inferior quadrant. If this is true, this pattern of visual field changes and NFL lost could be link to mitochondrial dysfunction related glaucoma. Since mitochondrial dysfunction could also affect the cellular function of the whole body, further detail survey for the function of other tissues and organs might be necessary for these patients. Moreover, it will be interesting to survey the effect of anti-oxidant therapies or other mitochondrial protective strategies in these mitochondrial dysfunction related glaucoma patients. There are several limitations of this pilot study. First, there might be many factors other than OPA1 polymorphism which still contribute the phenotype of glaucoma, and our case number is not large enough to reduce the interference of other factors. Second, it is inexorable to have some bias in comparison due to the design of this study which uses the ocular data from two eyes from each patient as two data. Finally, we do not have the data of those people with OPA1 polymorphism but without clinical signs of glaucoma. To improve the quality of this study, we will expand the case number and add a control group in future to get more information about the role of OPA1 polymorphism in NTG. We present this particular relationship between OPA1 polymorphism IVS8 + 32 T->C and certain specific clinical characters of NTG in Taiwan. To the best of our knowledge, this is the first report about OPA1 polymorphism related glaucoma in Taiwan. Even though our findings are far from clear enough to serve as guides for the differentiation of NTG etiologies, they still give us a glimpse of the impact of OPA1 in chronic optic neuropathy. Dielemans I, Vingerling JR, Wolfs RC, Hofman A, Grobbee DE, de Jong PT, et al. The prevalence of primary open-angle glaucoma in a population-based study in the Netherlands. The Rotterdam study. Ophthalmology 1994;101:1851-5. Iwase A, Suzuki Y, Araie M, Yamamoto T, Abe H, Shirato S, et al. The prevalence of primary open-angle glaucoma in Japanese: The Tajimi study. Ophthalmology 2004;111:1641-8. Chiu SL, Chu CL, Muo CH, Chen CL, Lan SJ. The prevalence and the incidence of diagnosed open-angle glaucoma and diagnosed angle-closure glaucoma: Changes from 2001 to 2010. J Glaucoma 2016;25:e514-9. Majeed F, Tauheed S, Aamir IS, Atif A, Majeed R. Frequency of normal-tension glaucoma in suspected cases of primary open angle glaucoma. Pak J Ophthalmol 2007;23:192-7. Buono LM, Foroozan R, Sergott RC, Savino PJ. Is normal tension glaucoma actually an unrecognized hereditary optic neuropathy? New evidence from genetic analysis. Curr Opin Ophthalmol 2002;13:362-70. Aung T, Ocaka L, Ebenezer ND, Morris AG, Brice G, Child AH, et al. Investigating the association between OPA1 polymorphisms and glaucoma: Comparison between normal tension and high tension primary open angle glaucoma. Hum Genet 2002;110:513-4. Aung T, Ocaka L, Ebenezer ND, Morris AG, Krawczak M, Thiselton DL, et al. A major marker for normal tension glaucoma: Association with polymorphisms in the OPA1 gene. Hum Genet 2002;110:52-6. Yu-Wai-Man P, Stewart JD, Hudson G, Andrews RM, Griffiths PG, Birch MK, et al. OPA1 increases the risk of normal but not high tension glaucoma. J Med Genet 2010;47:120-5. Liu Y, Schmidt S, Qin X, Gibson J, Munro D, Wiggs JL, et al. No association between OPA1 polymorphisms and primary open-angle glaucoma in three different populations. Mol Vis 2007;13:2137-41. Sato EA, Ohtake Y, Shinoda K, Mashima Y, Kimura I. Decreased blood flow at neuroretinal rim of optic nerve head corresponds with visual field deficit in eyes with normal tension glaucoma. Graefes Arch Clin Exp Ophthalmol 2006;244:795-801. Choi J, Kim KH, Jeong J, Cho HS, Lee CH, Kook MS, et al. Circadian fluctuation of mean ocular perfusion pressure is a consistent risk factor for normal-tension glaucoma. Invest Ophthalmol Vis Sci 2007;48:104-11. Tielsch JM, Katz J, Sommer A, Quigley HA, Javitt JC. Hypertension, perfusion pressure, and primary open-angle glaucoma. A population-based assessment. Arch Ophthalmol 1995;113:216-21. Choi J, Jeong J, Cho HS, Kook MS. Effect of nocturnal blood pressure reduction on circadian fluctuation of mean ocular perfusion pressure: A risk factor for normal tension glaucoma. Invest Ophthalmol Vis Sci 2006;47:831-6. Jonas JB, Yang D, Wang N. Intracranial pressure and glaucoma. J Glaucoma 2013;22 Suppl 5:S13-4. Stein JD, Kim DS, Mundy KM, Talwar N, Nan B, Chervin RD, et al. The association between glaucomatous and other causes of optic neuropathy and sleep apnea. Am J Ophthalmol 2011;152:989-98000. Mabuchi F, Tang S, Kashiwagi K, Yamagata Z, Iijima H, Tsukahara S, et al. The OPA1 gene polymorphism is associated with normal tension and high tension glaucoma. Am J Ophthalmol 2007;143:125-30. Ju WK, Kim KY, Lindsey JD, Angert M, Duong-Polk KX, Scott RT, et al. Intraocular pressure elevation induces mitochondrial fission and triggers OPA1 release in glaucomatous optic nerve. Invest Ophthalmol Vis Sci 2008;49:4903-11. Ju WK, Kim KY, Lindsey JD, Angert M, Patel A, Scott RT, et al. Elevated hydrostatic pressure triggers release of OPA1 and cytochrome C, and induces apoptotic cell death in differentiated RGC-5 cells. Mol Vis 2009;15:120-34. Powell BL, Toomes C, Scott S, Yeung A, Marchbank NJ, Spry PG, et al. Polymorphisms in OPA1 are associated with normal tension glaucoma. Mol Vis 2003;9:460-4. Woo SJ, Kim DM, Kim JY, Park SS, Ko HS, Yoo T, et al. Investigation of the association between OPA1 polymorphisms and normal-tension glaucoma in Korea. J Glaucoma 2004;13:492-5. Yao W, Jiao X, Hejtmancik JF, Leske MC, Hennis A, Nemesure B, et al. Evaluation of the association between OPA1 polymorphisms and primary open-angle glaucoma in Barbados families. Mol Vis 2006;12:649-54.